The J. Crew x Sperry Top-Sider collaboration isn't breaking news, but I finally got around to purchasing a pair of brilliantly-hued boating shoes just this past week. I had been eyeing the pink pair since mid-March, but wasn't sure if I should pick a pair of Sperrys in a less-practical hot pink or just go for a classic tan leather pair for the same price. Of course all considerations of the practicality of buying a hot pink pair of Sperrys went out the door when I saw them on sale in stores. 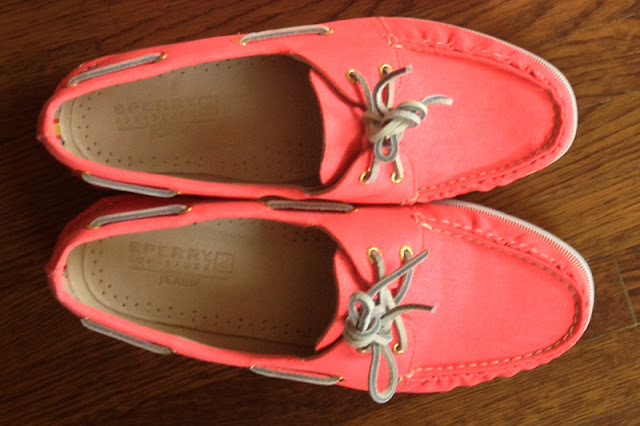 Sperrys on sale + extra 40% off sale items promotion + 15% student discount = one pair of flamingo pink Sperrys for a snazzy $30. There's two things I absolutely love: a good deal and pink. These babies gave me both! And, bonus points, they are super comfortable.